SMIL is the W3C recommendation for bringing synchronized multimedia to the Web. Version 1.0 of SMIL was accepted as a recommendation in June. Work is expected to be soon underway for preparing the next version of SMIL, version 2.0. Issues that will need to be addressed in developing version 2.0 include not just adding new features but also establishing SMIL's relationship with various related existing and developing W3C efforts. In this paper we offer some suggestions for how to address these issues. Potential new constructs with additional features for SMIL 2.0 are presented. Other W3C efforts and their potential relationship with SMIL 2.0 are discussed. To provide a context for discussing these issues, this paper explores various approaches for integrating multimedia information with the World Wide Web. 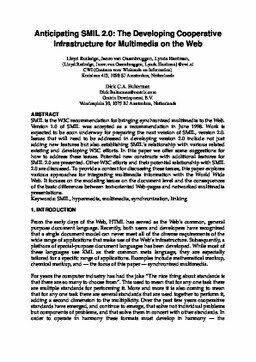 It focuses on the modeling issues on the document level and the consequences of the basic differences between text-oriented Web-pages and networked multimedia presentations. Rutledge, L, van Ossenbruggen, J.R, Hardman, L, & Bulterman, D.C.A. (1999). Anticipating SMIL 2.0: The Developing Cooperative Infrastructure for Multimedia on the Web. In International World Wide Web Conference 1999 (WWW 8). ACM Digital Library.